Powerful forces are reshaping the retail banking and payments industry. Customer expectation, technological capabilities, regulatory requirements, millenial demographics and new FinTech startups have all converged to create an imperative for change. 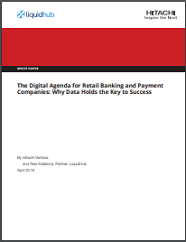 In this white paper from LiquidHub and Hitachi Vantara, learn why data holds the key to a successful digital agenda for retail banking companies and the payments industry.